You're invited to enjoy a special intimate performance by two of the founding members of the legendary Irish group The Saw Doctors! YES! Carnegie PA has landed a stop on the iconic members' acoustic tour of 13 intimate USA venues. But hurry, only 30 tickets remain! 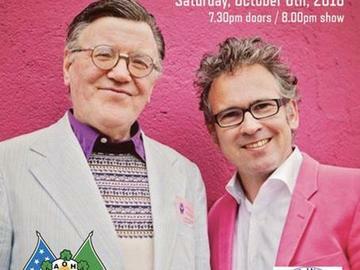 Singer Leo Moran and drummer Padraig Stevens - will perform in the Studio at the Andrew Carnegie Library in Carnegie, PA on Saturday, October 6th as part of an exclusive 13 date US tour promoting their new CD, ‘News From The Old Country’. Produced by Leo Moran and launched in July 2018, the CD features new songs from Padraig Stevens who co-wrote the Saw Doctors classic song ‘I Useta Lover’ and penned ‘Tuam Beat’ for Irish legend Christy Moore. The 14 tracks on ‘News From The Old County’ comprise affectionate, vivid, and tuneful celebrations of the colorful characters, rituals and rhythms of Irish rural life. But amid its bright sunshine, it also acknowledges the darkness of the world it fondly celebrates. Tickets: $25.00 Advance purchase by phone. There is a small additional tax/handling fee for all online ticket sales.